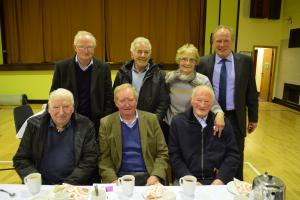 ‘Thank you’ was the main theme running through the Annual General Meeting of the Iverk Show on Monday night last. Taking pride of place was the huge thanks to Irene Purcell who was retiring as treasurer after 25 years. One can only say that the plaudits she received are well deserved. Irene has been a tireless worker for the show and has left the accounts in a very well organised position. “I have enjoyed it”, she said, “and now I look forward to helping out again with my first love, the arts and crafts”. We welcome Olive Keneally who is taking over from Irene and wish her well. In his report chairman Robert Dowley thanked everyone who helped in any way – big or small – to the make the 2018 show last August another outstanding success. 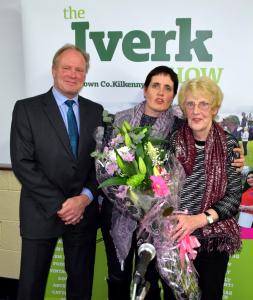 “It is a privilege” he said “to work with such a fantastic committee all dedicated to making the Iverk Show one of the best one-day agricultural events in the country”. In front of the largest AGM crowd ever of over 70, Robert welcomed everyone especially some new faces. He had a special word of welcome for 92 years young, show veteran Johnny Dooley. Robert thanked the land owners, vets, doctors, sponsors, exhibitors, Gardai, stewards, committee, volunteers and auditor. Without them we would not have the show we have. He singled out what he called the unsung heroes for special mention. The stewards in the car parks, he said, see very little of the show but without them traffic would be chaos. Entries in all the sections were on a par with other years. Despite watering the jumping arenas entries were back due to the fear of hard ground following the great summer. The support received from our local councilors , Kilkenny County Council, Kilkenny LEADER Partnership, Kilkenny Tourism, Kilkenny Heritage, Kilkenny Local Enterprise, Kilkenny and Waterford Chambers of Commerce, Heritage Council, KCLR, the ISA, The Munster Express and the press and local radio was also acknowledged. Anne Marie Power of Anne Marie Power & Co, Accountants and Auditors, announced a very good set of financial figures. The chairman said sponsors are already confirming their commitment for 2019. He said that in recognition of our success Aldi/ABP and confirmed a new four-year sponsorship package for the big Irish Angus bull calf championships and will be introducing a young handler’s championship. At the thanksgiving service in Saint Pauls church before the meeting we remembered those who have gone before us and their contribution to the development of the show to where it is today. 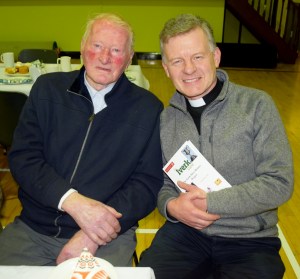 In his address Reverend Trevor Sargent encouraged us to look after the ‘good soil’ and compared it to the Kingdom of God as told in the Parable of the Sower.